The moment has finally come. 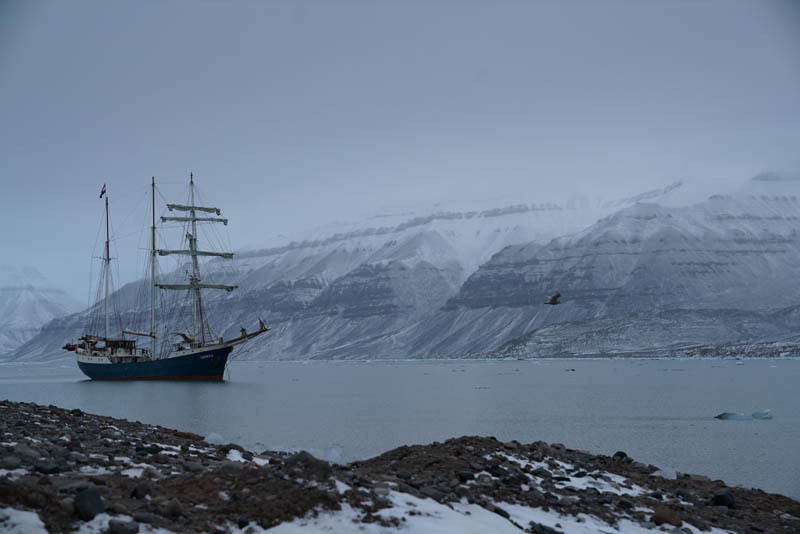 We are sailing out of Longyearbyen on the Antigua, a 165 foot Norwegian tall ship. As we depart, snow dusts the deck and dolphins swim in our wake. I am on a boat with 29 other artists for the The Arctic Circle Autumn Art & Science Expedition. During this two week expedition, the night will last 20 minutes more each day. By the time we disembark, daylight will have collapsed by six hours, the sun rising at 9:59am and setting at 3:23pm disorienting our sense of time. It's a rough start. As soon as we sit down for dinner the boat really starts rocking. Three people get sick. What was I thinking? I pop two pills and head to my cabin. They make me feel dizzy and sleepy. Due to a big swell and wind, we are forced to make a course change of 180° degrees and head back into the bay. Sailing North East. 20:40 - Sails up, engine off. Northern lights! I am below deck knocked out by sea sickness meds and feeling woozy. 22:50 - Anchor down, Bjonahamna. In the morning we have a Zodiac briefing by the Captain. Our guides, toting rifles and flare guns secure a perimeter before we make a landing at Bjonahamna. There are more Polar bears than people on this island. Afternoon - 14:05 - Anchor up, sail to Tunabreen. 15:55 – Anchor down 78°23,1'N, 017°23,7'E. I look towards Tunabreen and am swallowed up by the immensity of the glacier. My attempt to capture this place is futile. There is no way to express the sublime feeling with a picture, a video, or words. It is unphotographable. Ineffable. Exquisite. I wish i could make time stand still — and capture this moment for you. But my photos can’t capture the vastness. The scale. The cold. The smell. The crackling sounds. The feeling swallows you whole. You're just this tiny little speck in this infinite space. There is a loud quiet – the water makes noises like a fizzing glass of 7up as air bubbles escape from the glacial ice melting in the water. As soon as I step on deck, I hear the crash of glacier falling into the sea. It sounds like an explosion echoing across the water. Our guide tells us polar bears aren't afraid of the sound of gunshots because it sounds the same as a glacier calving. Landing at the newly discovered ́Jægerøya ́ island after our guide, Kristin Jæger Wexsahl, discovers what once appeared as a spit of land connected to the glacier Tunabreen is actually an island. A large group of Belugas swim by the ship through the shallow shores. I take a few photos, but the belugas only appear as white specks. I thought I would be lucky to capture glaciers calving. I didn't realize that it would happen with so much frequency and ferocity. The ice falling displaces the water so violently it creates a set of surfable waves crashing on the shore. Our guide, Sarah, said she has never seen anything like it. I wake up 5:00am to the boat rocking like a see saw. I push my legs and arms against the cabin walls to stay in place on my upper bunk. We attempt to make it out of Isfjorden and enter the open ocean. The boat heels up to 30° which makes water splash against my porthole. The captain decides to turn around at 6:30am because of the strong SW swell. By 8:30 we enter less wild waters. 9:50am – Anchor down, Ymerbukta, 78°18,0 ́N, 013°57.2 ́E. -2°C, 2m/sec, some clouds but mainly bright sunshine and strong colors. Wind picking up from the South at the end of the morning – increasing swell. Overcast during the afternoon – 1°C. Sunrise 09:13 – Sunset 18:15. Morning – Stationary, short, and longer hike to or towards the glacier Esmarkbreen. Afternoon – Landing on the land spit in front of Esmarkbreen. 18:00 - Anchor up. Moving to the other side of the fjord — strong winds from the South are expected. 19:20 - Anchor down, Ymerbukta, 78°16,6 ́N, 013°57.6 ́E. Today we were ´værfast´ — stuck due to weather. It is impossible to make a landing because of high winds. Despite using two anchors and 270 meters of chain we are still traveling half a knot per hour. I learn that anchors are not what hold you in place, rather it is the weight of chain. Most of the women on the ship decide to so "swimming" which means they use the ladder to take a microsecond dip off the side of the boat wearing nothing but a leather belt so we can pull them back on board. As we are conserving water — it also serves as a makeshift shower. 3°C, 10m/sec. Sunrise 09:29 – Sunset 17:58. 09:20 – 2nd anchor up. We finally sail out of Isfjorden! Morning sunshine on Alkhornet. 16:30 – Abandon ship drill. 17:20 – Fire drill. 21:14 – Anchor down, Blomstrandhamna, 78°59,6 ́N, 012°04.6 ́E. Costume party above the 78° parallel north! 0°C, 5m/s. Overcast. 2°C, overcast and a little bit of rain in the afternoon. Sunrise 09:37 – Sunset 17:49. Morning – landing on an island in front of Blomstrandbreen. 10 years ago, the glacier was still connected to the larger island called Blomstrandhalvøya, 'flower beach peninsula'. When the glacier retreated it became clear that it was an island in stead of a peninsula. The small island we land on was still covered by the glacier about 7 years ago. 13:20 – Anchor up. Passing through uncharted waters – zodiac measuring the depth in front of Antigua. We make it. 14:55 – Anchor down, Blomstrandbreen, 79°00,2 ́N, 012°13.1 ́E. Afternoon – Landing close to Blomstrandbreen. We hike to look at the glacier from another vantage. The fog rolls in and we might not be able to see anytthing. But as we approach it disperses and we can take in the immense view of glaciers in every direction!